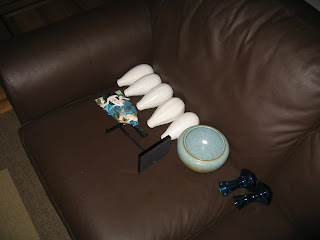 Today we had Chad's knitting group over for a pot luck gift exchange (leftover from the Holidays). It was loads of fun. 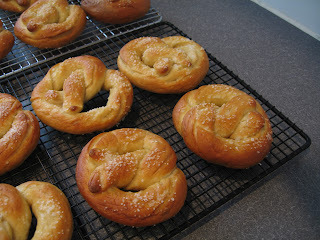 I made these pretzels from scratch! Nom nom. 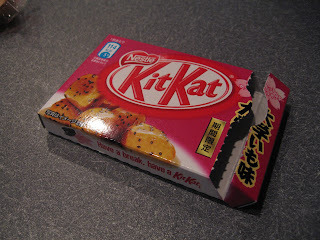 Erin brought us these KitKat bars from JApan. I'm not sure what the flavor was supposed to be, but basically they just tasted sweet. Haha. 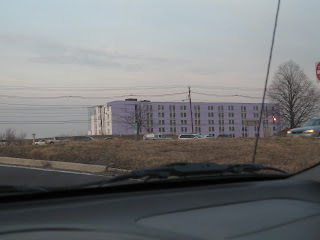 For some reason, with the bad economy, I expect construction projects to just come to a halt. This one near my office continues though. I like the purple. 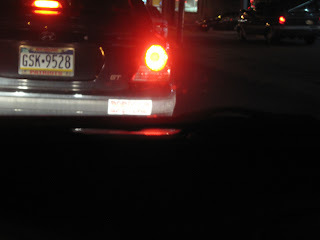 This person had a "Barack to the Future" bumper sticker on his/her car but I couldn't get a good photo on it. I thought it was kinda cute. 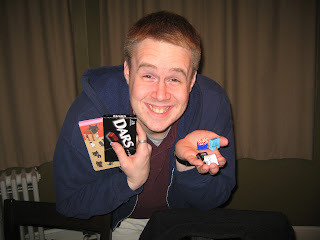 Chad received a package from my parents for his birthday today. It had some Japanese snacks in it, I guess as a preview of what's to come! Can't wait. Today was Chad's birthday so I decided I had to make him a cake. I made this vegan spice cake. 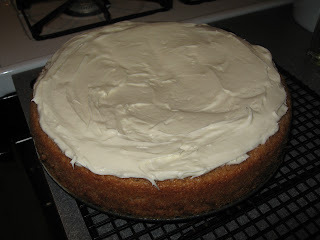 I made cream cheese frosting - I even had to make powdered sugar! 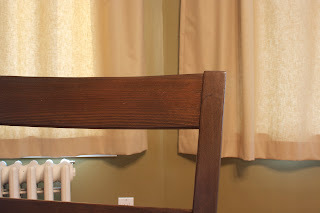 I'm going to be experimenting a lot with my new camera. 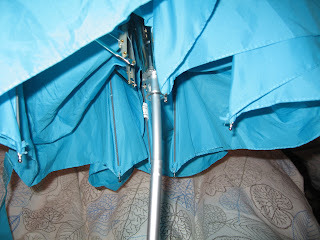 I took this one because I read that a narrow aperture will give clearer pictures. Turns out it's true! Today I went to Heather's house with our book club friends and watched the 5-hour long BBC version of Pride and Prejudice. It was awesome! Chad wanted to open his presents tonight even though his birthday isn't until Monday. So I let him because ... well, what do I care? Hahaha. Whatever makes him happy. Okay, these aren't my only shoes so I'm okay. 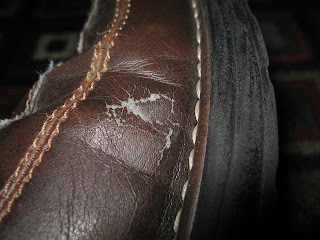 But I got these at Payless about 4.5 years ago and the outside is starting to wear off. Guess I should replace them! 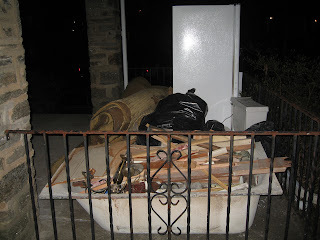 I came home today to find all this stuff out on the neighbor's front porch from all the renovations going on. Lovely. Plumbing problems turned out to be nothing. The plumbing problems mean that someone is coming out on Tuesday to rip up the basement floor and fix the sewer line. So we took breakables off the walls and shelves. 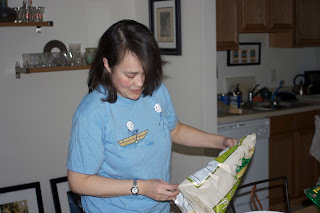 Tonight we ended up at Erin's house to spend the night because of plumbing issues at home. 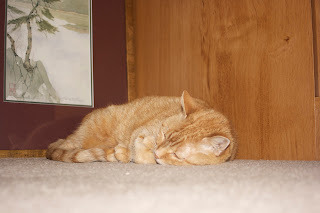 Look how cute Honey is lying here! 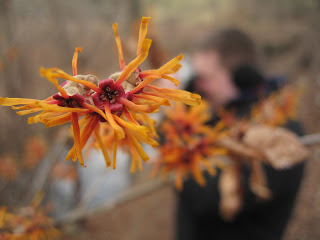 Today we went to Ikea with Aunt Beth and then stopped at the Arboretum to see witch hazel. In this photo are witch hazel blossoms and Chad. Two of my loves! 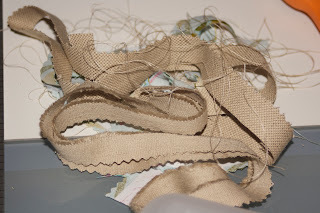 Chad worked on a sewing project tonight and there were these thread and fabric scraps on the table that I thought looked pretty cool. 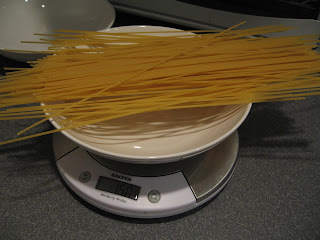 Have you ever seen someone measure out spaghetti to make sure it's the right number of servings? Well, the box has 6 servings, so we made sure to split it perfectly. 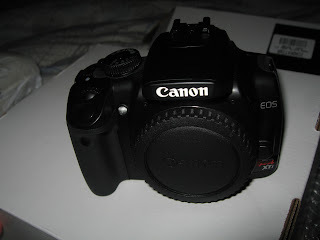 I couldn't stand it anymore so I finally got myself a digital SLR. I found a great deal on a refurb body only and since I already have lenses I went for it. It is awesome! 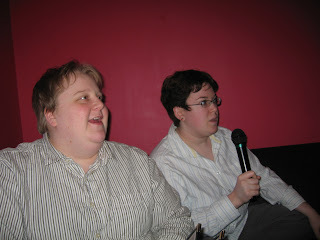 Adina and Steph came up to Philly for the night so we met up for dinner and singing at Yakitori Boy. 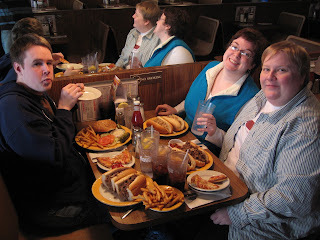 It was awesome - the food, the songs, the company. Ice cream too. Yum. 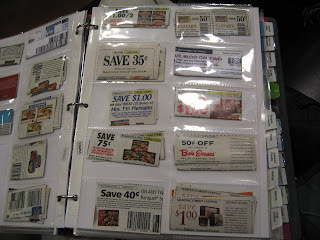 Tonight at my book club meeting, I discovered that some people can be incredibly organized with their coupons. I had no idea coupon cutting could be such an art! 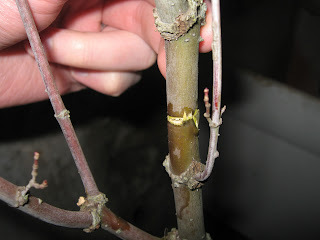 The excitement surrounding the arrival of our Arakawa was soon diminished when we discovered that the main branch was broken. It looks like we'll have to send it back. I love Blue-Ray. I would love it even more if we had a larger TV. Hehehe. 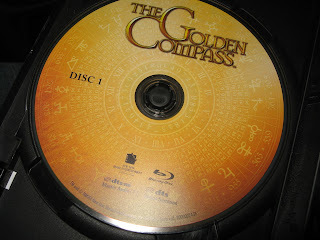 Chad and I watched the Golden Compass on Blu-Ray tonight. It was pretty sweet. 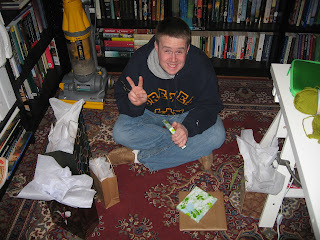 February 6, 2009: Arakawa Arrives! 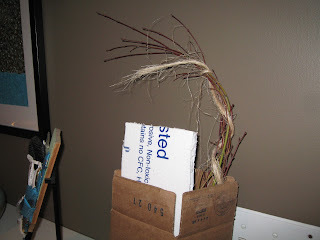 Deb and Bud ordered a Acer palmatum Arakawa (Roughbark Japanese Maple) tree for us for Christmas. It arrived today and it is so cute in its box! 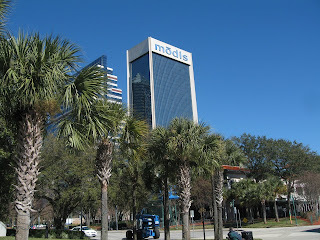 Apparently this Modis building is a Jacksonville landmark. It was a pretty cool structure. I think it looks neat with the palm trees. I had to get up pretty early to attend a Speaker's Breakfast (my presentation was today). 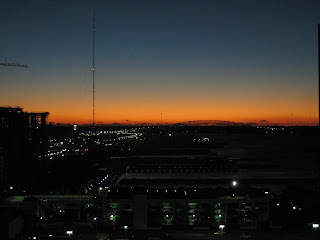 I was greeted by a pretty nice sunrise coming up over the river. Today I flew to Jacksonville to attend the Battelle Conference. 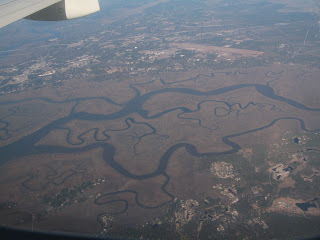 Check out this awesome scenery from the airplane! I found out this morning that I need to fly to Jacksonville tomorrow morning to give a presentation at a conference. Surprise! 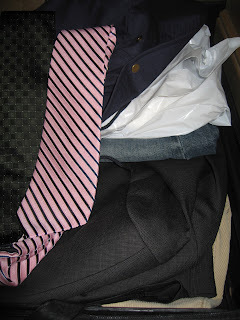 So now I'm packing up my clothes. To finish out the weekend we went yarn shopping this afternoon and then we went over to our favorite cheesesteak venue Fiesta Pizza V and proceded to gorge.